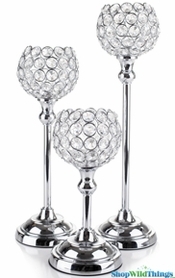 Grand and stately, sparkling and majestic, our new Silver Prestige Candelabra with Real Crystal Beads and 5 Arms is nothing short of impressive! 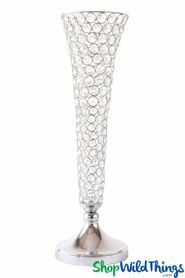 This beauty stands 29 1/4" tall by 20" wide and the decorative arms hold stunning crystal beaded cups, loaded with genuine crystal beads that are faceted and glisten with the slightest bit of light. Each cup is 5" wide by 5" deep and has a removable votive holder that is 2" in diameter. You will also receive 20 crystal strands which you can attach with jump rings (included) to the bottom plate of each cup if you choose. 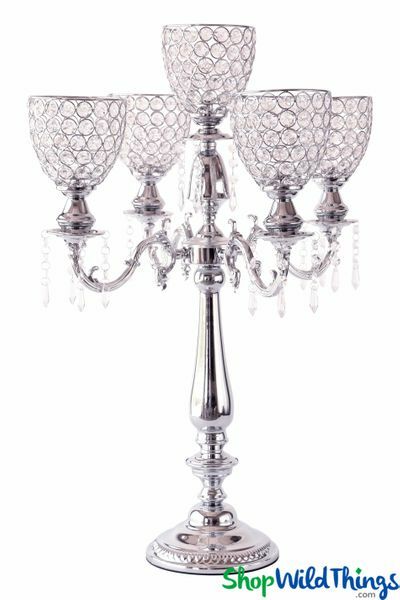 The chrome finish is reflective and has a very light brushed look which really adds to the rich look of this candelabra. This truly inspirational piece is an ideal centerpiece by itself or you can use it to accentuate and highlight a dessert table or gift table. Drop in our LED Flameless Flickering Tea Lights or Flameless Wax Votive Candles to complete your spectacular showpiece! You can also change up the look by adding colorful submersible battery operated LED lights or by adding colorful silk rose petals around the base of a flameless candle. This candelabra weighs just over 9 lbs. 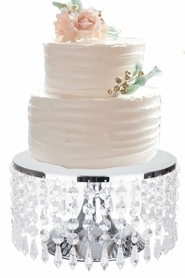 Our amazing line of Prestige Candle Holders, Cake Stands, Centerpiece Risers and Vases will complete the luxurious look and feel that you've been yearning for! Candlelight is an essential element for any celebration or festivity and the grandeur of this candelabra promises to make your event special and memorable! Perfect look for the setup. This candelabra is even more stunning in person than in picture. It has good, solid weight to it and I can't wait to use it for my clients wedding. I will definitely be purchasing from this company again.